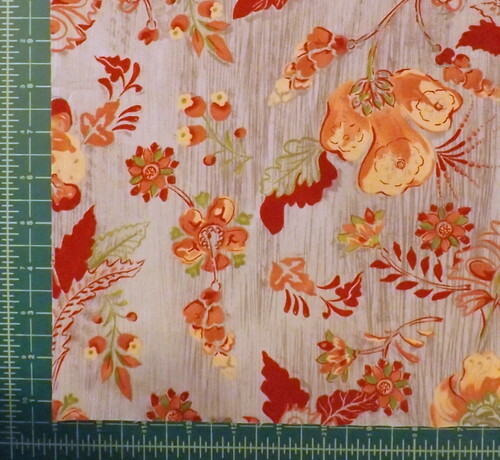 I’ve had a soft spot for this fabric (and its coordinating prints) since I picked them up at Joann’s on a clearance sale. They’ve a lovely hand to them, almost a flannel finish. 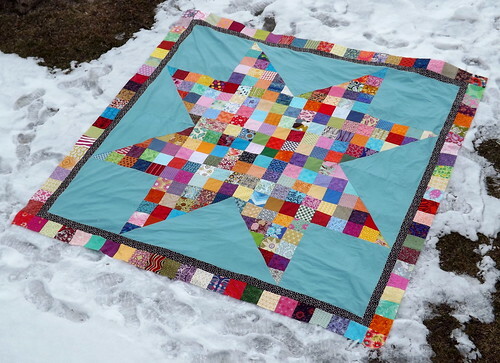 Beautiful stuff, and ideal for a baby quilt. It took a few evenings’ worth of piecing and ironing to get this together. Mostly in ironing, really. This pattern benefits wonderfully from nesting your seams. Honestly, it’s so simple, it really doesn’t need a pattern, just some basic math. The photo doesn’t really do this quilt top justice… It was bright out when I took this photo, so it’s hard to tell just how beautifully the mix of scrap squares glows against the background fabric. I’m picking up batting today for this – I only have large batts on hand, and I don’t want to cut into a package already earmarked for a larger project. 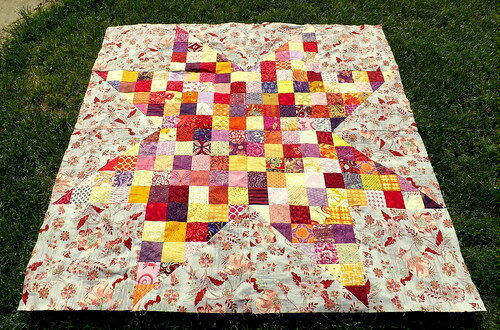 My plan is to have this quilted this weekend, and then I’ll start quilting on something else. I have too many tops sitting around here.